**We strongly recommend you have a solid knowledge of web design before you try to do this. OR you read this whole article before you embark on the journey. If you want to apply a custom style sheet to the entire form go access the desired form (How to Access a Form) and click on the 'Design' tab. 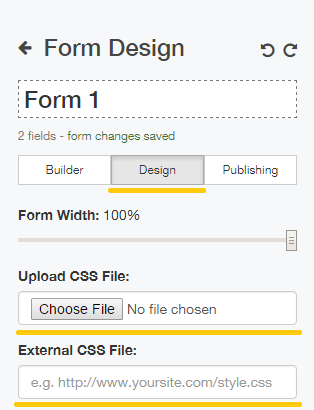 Upload a file or link to the CSS using the appropriate boxes. From here you can view, delete, and re-upload the style sheet as you see fit. The CSS will save automatically. Refresh and preview your form to see the changes (How to Preview Form). If you want to apply a custom styles to a specific field you first have to create a class in your style sheet and upload it using the steps above. 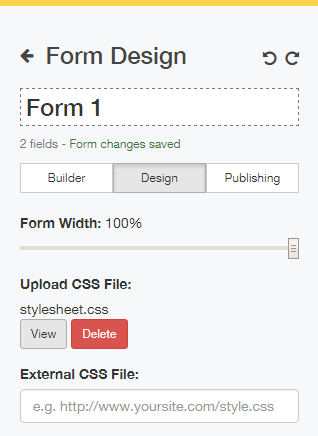 After you have done that, access the desired form (How to Access a Form) and click on the field you wish to customize. 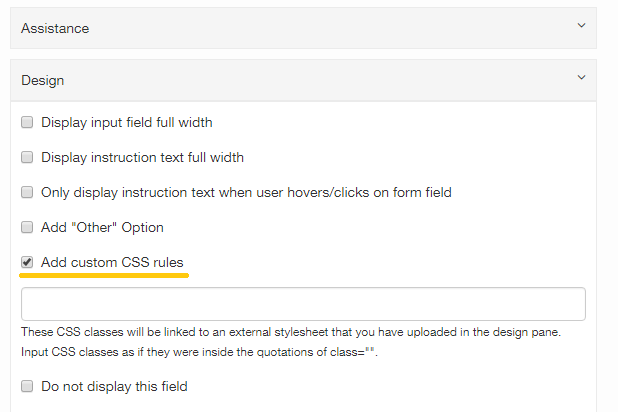 Enter into the 'Design' menu of that field and check the box that says 'Add custom CSS rules'. A text box will come up. Here you can type the name of the class you wish to be applied to this field. Make sure that the class already exists in the style sheet you uploaded. If you wish to apply more than one class simply separate them with spaces.